For great travel photos, focus on the little things. As a photographer, you will notice that some of the instinctive behaviors are detrimental to the success. Make sure that you have checked our article on tips for traveling with DSLR camera and equipments. Travel Photography Tips is always a good and basic article to start with, if you are new to travel photography. Regarding the travel photography, one of these instincts is to try to always put as much as possible within a photo. For example, if you visit India, your first target, at least for the 85% will be to frame Taj Mahal in the way photographers are doing since black and white primitive photography era – the object, it is definitely just an object if we look from satellite. But you are looking as a normal sized human from plain land at Taj Mahal. Additionally, kind of mixture of peoples, your realization that the thing is not what you thought or imagined of – may be it towards the good or bad – these provokes our basic instincts. Plus in case of India, there is enough chance to get ripped off if you are not with your Indian friend. When your basic social thoughts will not work, your photography will fall back to the default settings. More complex is the place, more will be the difficulty. It is less difficult for me to visit San Antonio and get in to such situation – because the demographics, the peoples are more in favor. But, it might happen that, in San Antonio there is kind of tourist spot where there are pathetic things which I never expected. An Indian is neither much abnormal to be in view in San Antonio nor in specific target. In this article, however, we want to explain the importance and benefits of capturing the details, the small things to make more original and beautiful photos easily. Not actually the effects of demographics, it is probably a kind of matter of research. You took a beautiful photograph of your boyfriend or girlfriend sitting somewhere at Taj Mahal or nearby – that is a solid legal document that he/she went there. May be it has a big value from your emotional corner. But, imagine how the little poor children are starring at your boyfriend or girlfriend – just the eyes. It is easy to imagine the blurred outline of part of Taj Mahal at background, it is not really that easy to catch a new thing. Photography is an art, it is about unique creation. Think hard about when you did not know anything about photography (or think about your current situation, if you have just started to go into that). How many photos did you took of monuments, cityscapes, landscapes, huge rooms in historic buildings? You can also see in the behavior of the other tourists. Typically, in front of the most famous monuments there are throngs of tourists with the camera in hand writhing to get away as much as possible, broaden our vision and capture the monument in its entirety. No doubt you can make beautiful pictures that cover very wide views, I’m not necessarily saying that these pictures are bad. However, there are at least two drawbacks. First, since this is instinctive behavior, is likely to do the same pictures, the ones that everyone is doing and that you yourself have already done. If you do not try you focus on the details, surely lose a large number of original photographic opportunities. Second, the photos that cover a wide area are not easy to do. Introduce more things in the picture, the easier it is to introduce something that will ruin. For photograph and art often less is more . Often, the smallest elements explain things to the place where you were. Think for example; food, clothing to architectural details. These suggests you as a viewer the details of the stories that give a character to the places you have visited. Also, just because instinctively we neglect all the details, the photos of them do suffer from a higher loss of proper quality. In fact, the viewer realizes that there is something original, so you immediately should recognize these as a more skilled photographer. The photographer should always be attentive to detail and adept to catch. Your eyes must always be trained to find what the other escapes and turn it into a beautiful picture. From a compositional point of view, focus yourself on the details is of great help. It helps you to simplify the background, removing the distractions that, as we mentioned above, which are typically known to decrease the efficiency of the photo. We have discussed about what are the elements which are taken as guide to discover in this next article as the final part of this guide. The reason to make them separate is the required mood is different for analysis and learning. This Article Has Been Shared 5406 Times! 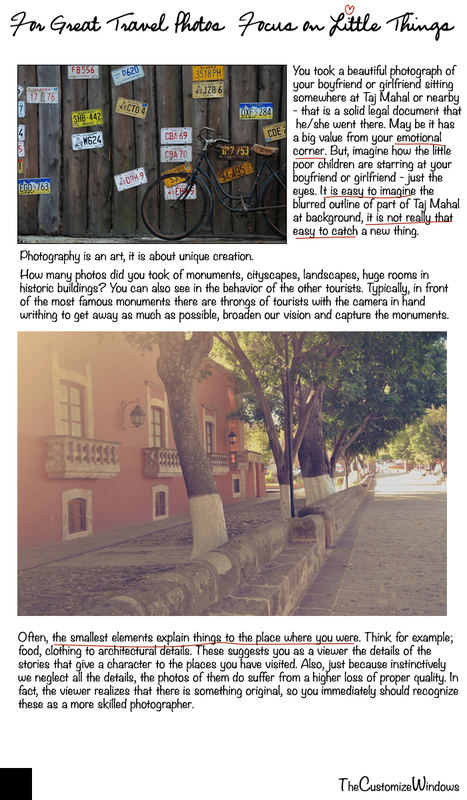 Cite this article as: Abhishek Ghosh, "For Great Travel Photos, Focus on Little Things," in The Customize Windows, August 4, 2013, April 21, 2019, https://thecustomizewindows.com/2013/08/for-great-travel-photos-focus-on-little-things/.